Eagle Bay's Single Series features super limited, brewery-only releases that allow their brewers complete freedom to experiment with different ingredients, explore new styles and most importantly, have some good old fashioned brewhouse fun. The latest is a locally-inspired gose brewed with Geraldton Wax, saltbush and saltwater drawn from Eagle Bay Beach. The brewers reckon it's so local, simply naming it after their postcode is apt. 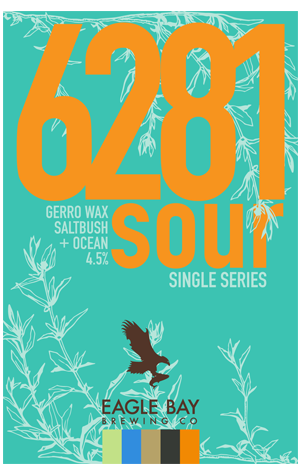 6281 Gose is a low IBU, 4.5 percent ABV sour ale that's full of vibrancy. An abundance of fresh lemon peel and hay fill the nose and the palate alike. The saltbush brings with it some fresh, earthy notes and elevates the citrus vibes of the Saphir and Citra hops, while the subtle spice character is the result of a touch of rye in the grain bill and and the estate grown Geraldton Wax. Eagle Bay's latest is going to just see out the end of the summer days but will no doubt be lapped up by locals at the brewpub til it's gone; a few kegs may make it out of the brewery too, so if any WA sour beer fans should keep their eyes peeled for what's a very tasty, very limited release.